UFO means 'Unidentified Flying Object'. What are UFOs? Are they real? What do UFOs look like? This book will tell you. Do aliens exist? What colour are they? Have aliens visited the Earth? Who has seen them? Have people really be taken away - or abducted - by aliens? 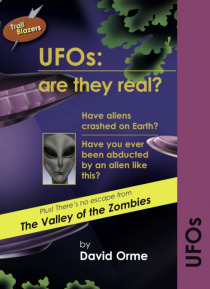 Then read a great story about aliens invading Earth: 'The Valley of the … Zombies'. This fantastic book features an exciting combination of both fiction and non-fiction. The non-fiction section enables readers to engage with the subject matter, using dramatic illustrations and bite-sized texts. The beautifully illustrated fiction story appears in two formats - short, simple texts for more able readers and an illustrated 'speech bubble' version of the same story, for those who are really struggling. Part of the Trailblazers series, this book is brilliant for keeping reluctant readers engaged.